24+ Seeds. Don't let the delicate looking flowers fool you - these are TOUGH plants! Like all Sage (Salvia), they prefer full sun and fairly dry conditions. Oh, and did I mention the hummingbirds and butterflies also love them? 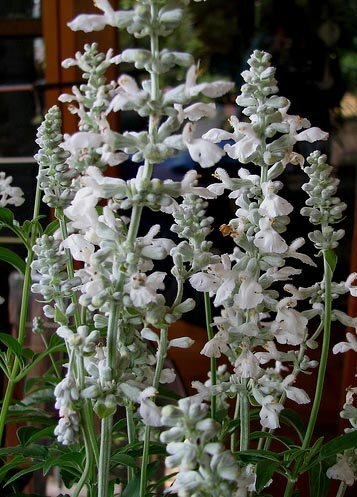 These Salvia reach 18-24 with PURE WHITE blooms atop slender stems. They really make an impact planted in a group - plant with the red or blue sage/salvia for a wonderful contrast! 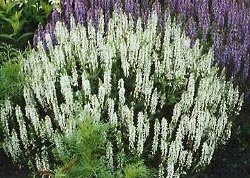 24+ Seeds for Salvia / Sage (Salvia Farinacea) VICTORIA WHITE (aka: Mealy Cup Sage, Mealycup Sage). Pure White blooms atop slender stems that reach 18 - 24. Especially lovely when planted in groups or alongside the blue or red sage/salvia. Can also be grown in containers. Don't let the delicate looking flowers fool you - these are TOUGH plants! Like all Sage (Salvia), they prefer full sun and fairly dry conditions - they definately don't like wet feet, but they will bloom from mid-summer to frost for you growing in dry, poor soil and full boiling sun! What more could you want?! These plants reach 18 - 24 tall pinch back to make them bush out and you'll get more blooms. Seeds are very small - I suggest starting in pots and setting out to keep them from being washed away by a heavy rain.